A lot of American voters tend to approach elections like they approach food, clothes and entertainment. They choose what they like “in the moment”. But feelings about appearances is not the right way to measure a candidate. The right way to measure is by looking at the voting record. 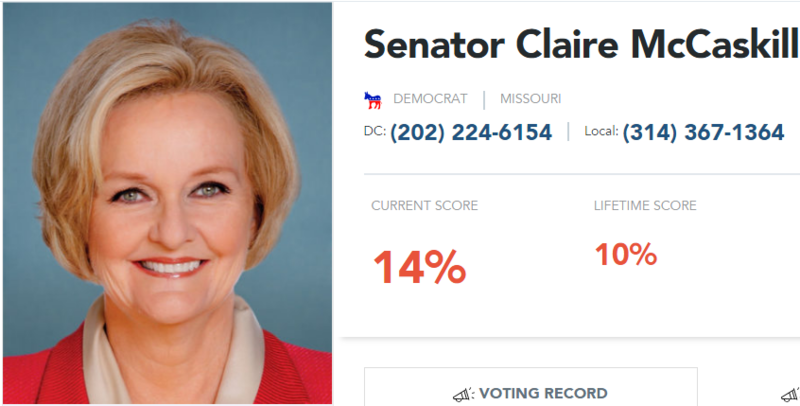 So let’s do that with Democrat Senate candidate Claire McCaskill of Missouri. Disapproval of the Trump Administration’s “Short-Term, Limited Duration Insurance” Rule10/10/2018The Senate voted on a Joint Resolution (S.J. Res. 63) providing for congressional disapproval of the rule issued by the Trump administration related to “Short-Term, Limited Duration Insurance.” Sponsored by Sen. Tammy Baldwin (D-Wis.), S.J. Res. 63 would use the Congressional Review Act (CRA) to overturn a new Trump era rule that would expand the availability of affordable short-term, limited duration health plans to one year. To confirm Brett Kavanaugh to the Supreme Court10/05/2018The Senate voted on the confirmation of D.C. Circuit Court Judge Brett Kavanaugh to the Supreme Court. Judge Kavanaugh was nominated by President Donald Trump on July 9th, 2018 and was included in The Heritage Foundation’s original list of potential Supreme Court nominees. Bloated $855 Billion CROMNIBUS Spending Package09/18/2018Back in March, President Trump nearly vetoed a $1.3 trillion omnibus spending bill promising the American people that he “will never sign another bill like this again.” One of the President’s objections to the omnibus was its lack of conservative policy riders – particularly sufficient funding for border security – combined with increases in the Democrats’ spending priorities. Six months later Republicans and the President find themselves in a similar situation. Paul Amendment to defund Planned Parenthood08/23/2018To prohibit Federal funds being made available to a Planned Parenthood and other abortion facilities. Motion to table Cruz, Cotton, Lee, Johnson D.C. Individual Mandate Amendment to Senate Minibus08/01/2018The Senate will vote on an amendment offered by Sen. Ted Cruz (R-Texas) to Fiscal 2019 Interior-Environment, Financial Services, Agriculture, and Transportation-HUD Appropriations Act (H.R. 6147). The amendment would prohibit funding for the District of Columbia’s Health Insurance Requirement Amendment Act, essentially Obamacare’s individual mandate penalty applied to the district. Heritage Action supports the amendment and is opposed to the motion to table it. 2018 Food Stamp and Farm Bill06/28/2018This month, the Senate could vote on the Agriculture Improvement Act of 2018 (S. 3042), more commonly known as the “farm bill.” Despite repeated calls to enact work requirements for food stamp recipients and to reform runaway farm subsidies, the Senate Agriculture Committee approved a farm bill that maintains dysfunctional and distortive status quo welfare and agricultural policies. Rescissions Package to Cut Spending from Expired and Unnecessary Programs06/20/2018This week, the Senate will vote on the Trump administration’s rescissions request to cut spending by nearly $15 billion, titled the Spending Cuts to Expired and Unnecessary Programs Act (H.R. 3). Under current law, the Senate has until June 22nd to approve the House-passed bill under expedited rules. Repeal of the FCC’s “Restoring Internet Freedom” rule05/16/2018The Senate voted on a Joint Resolution (S.J. Res. 52) providing for congressional disapproval of the rule issued by the Federal Communications Commission (FCC) related to “Restoring Internet Freedom.” Sponsored by Sen. Edward J. Markey (D-Mass. ), S.J. Res. 52 would use the Congressional Review Act (CRA) to reestablish draconian net neutrality regulations imposed on broadband internet service providers under former President Obama’s FCC. Those net neutrality rules were recently repealed by the FCC under the courageous leadership of Chairman Ajit V. Pai. Cloture for Schumer-Rounds-Collins Amnesty Amendment02/15/2018The Schumer-Rounds-Collins amnesty proposal, revealed by the “Common Sense Coalition” drew fire from the Department of Homeland Security (DHS), which said the bill would “effectively make the United States a Sanctuary Nation.” Entitled the “Immigration Security and Opportunity Act,” this legislation provides amnesty and a path to citizenship to millions of illegal immigrants, fails to end chain migration and establish a merit-based immigration system for the 21st century, fails to secure the southern border, and undermines internal enforcement immigration policy. Tax Cuts and Jobs Act Final Vote12/20/2017This week, the House and Senate will vote on the Tax Cuts and Jobs Act (H.R. 1), the most significant tax reform and tax cut legislative initiative since the 1986 tax reform package passed under President Ronald Reagan. The bill would make sweeping changes to the individual and corporate codes, and eliminate Obamacare’s individual mandate penalty. Expanding 529 Savings Plans12/01/2017The Senate could vote on an amendment (#1725) offered by Senator Ted Cruz (R-Texas) to the Tax Cuts and Jobs Act (H.R. 1) that expands higher education savings plans to include K-12 private school tuition and homeschool expenses. This amendment would help expand school choice by allowing families to use 529 account funds to help pay for private elementary and secondary education, including homeschooling. Repeal Title I of Obamacare10/19/2017The Senate will vote on an amendment (#1430) offered by Senator Mike Lee (R-Utah) to H. Con. Res. 71 that would repeal Title I of Obamacare. This amendment expands the budget resolution’s existing deficit neutral reserve fund for legislation that repeals Obamacare to specifically include the repeal of Title I of Obamacare. Later this week, the Senate is expected to vote on the confirmation of Tenth Circuit Court of Appeals Judge Neil Gorsuch to the Supreme Court. Judge Gorsuch was nominated by President Donald Trump on January 31, 2017. Disapproval of Title X Funds for Planned Parenthood03/30/2017This week the House of Representatives is expected to vote on H.J.Res. 43, sponsored by Rep. Diane Black (R-TN), a disapproval resolution of the final rule submitted by Obama’s Secretary of Health and Human Services (HHS) relating to compliance with Title X requirements by project recipients in selecting sub-recipients. Title X of the Public Health Service Act provides federal funds to states for family planning grants. Once states receive the funds, they have the ability to prioritize sub-recipients, directing funds to organizations like community health centers and family health clinics. While federal law prohibits government funding for abortion, it does allows certain public dollars, like the Title X grants, to support abortion providers if the funds are directed to non-abortion related health services. Under this exception, Planned Parenthood has been eligible to receive Title X funds, per the states’ discretion.